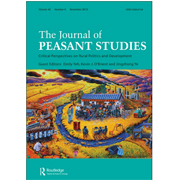 The Journal of Peasant Studies is celebrating its 40th anniversary in 2013-14. Part of their series of initiatives to commemorate the anniversary of JPS is the publication of virtual special issues, starting with the 40 Classics in Peasant Studies. The second in the series is JPS 40: Peasants & Politics. This collection highlights some of the key articles that have been published in the journal over the past four decades on peasant politics. They launched it during the week of 17th of April to coincide with the International Day of Peasant Protest.